I’ve now been using the Clarisonic system as a daily (twice a day) part of my cleansing routine since mid September now so I feel I’ve given it a decent amount of time to form an opinion. Trouble is, I’m still not 100% sure how I feel about it. But I’ll try and form that into words for a review. So, for the first couple of weeks when I started using the Clarisonic PLUS system my skin broke out quite badly, as I expected as had read this is a common side effect of the skin being so deeply cleansed. So whilst I didn’t love having the spots, I was encouraged by the fact that the gunk was being cleaned from my skin. So I continued using the Clarisonic, I definitely feel that my skin is far cleaner after using it. Especially at the end of the day, when an oil pre-cleanse, followed by Clarisonic removes every tiny spec of make-up (with a bit of eye make-up remover of course). But do I think the condition and texture of my skin has improved significantly? This is where I get a little bit uncertain. Yes, it’s much cleaner and minus a small break out when I didn’t use the Clarisonic for a couple of days my skin has stayed pretty clear of spots. But I luckily have fairly decent skin anyway and only tend to get the odd spot. The think I have been keen to see if there is any improvement in is the blackheads that I suffer from on the sides of my nose and chin area. 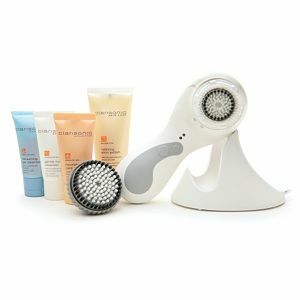 I had a facial at the beginning of using the Clarisonic, so I was measuring from that point and to be honest I don’t really feel that there has been a significant improvement, so I can’t in all honesty say that the Clarisonic has helped to shift them. But the question I have been asking myself is wether it’s fair to expect it to? Or is that just something that a proper extraction can do? But the key thing that is influencing my opinion of the Clarisonic is something I mentioned above. The fact that it was when I took a brief break from using it that my skin reacted badly and I broke out in spots (in my chin area) it makes me think that this is one of those products that becomes one of those essentials that you don’t realise how much you need it until you stop using it. So whilst I haven’t been astounded by the improvement in my skin, I am impressed by the fact that it has managed to clean out some deep seeded gunk and has kept my skin consistently clear from spots. I would suggest that if you are thinking of getting a Clarisonic then make sure you consider what sort of condition your skin is in to start with and don’t necessarily expect miracles – but do have high hopes for your skin being consistently cleaner than pre-Clarisonic. If you suffer from occasional spots then this could be the solution (although as always, although it’s worked for me – everyones skin is different) just don’t expect your skin to look ten years younger with the skin of a Victoria Secret model sans-make up. Of course, I have to mention to cost of this beauty gadget – the Clarisonic Plus is £175 (the classic version is £150) and in America there is a lower priced ‘Mia’ version, but there is no sign of it hitting our shores yet. The ‘Plus’ system comes with two heads – one for face, one for body. Plus three sample sized cleansers (a refreshing one, a gentle one and a hydrating one) plus a body polish. Of the cleansers, I only really like the refreshing one because it’s the only one that foams – and that’s a preference for me when it comes to cleansers in general. I haven’t tried the body attachment or polish yet, but when I do I will blog about it. I hope that is somewhat helpful if you are considering trying the Clarisonic. If you have any questions do let me know and I’ll answer them best I can. You might also want to read my first impressions post that I wrote a couple of weeks after starting my Clarisonic test. I totally agree with this review. I just got one myself, the Clarisonic plus. So far so good. Kind of early to tell. I really like it for the body. It’s great for your back. Makes it to where I can finally reach it! I think this was a really great review of the Clarisonic. I too use the Clarisonic and can attest that it is great but not a miracle worker. I plan to write a review of it as well, as I have been using it since July. I break out about once a month, and the Clairisonic has not stopped my breakouts. I do love it though, because it makes my skin feel softer and cleaner. I have the regular Clarisonic (with normal brush, not sensitive) and been using it for 2 months, generally daily and with the 2-minute option. I agree with your uncertainty. It definitely cleans my face much better than I did before and I can tell that moisturizer, glycolic lotions and even blusher apply better. It doesn’t really work on deeper issues; I do facial waxing at home and hasn’t helped the dry, flaky areas that appear. (Although I think it’s helped prep the areas I wax better.) Plus maybe it’s me, but the process is messy and cleanser keeps getting in my eyes (I have to keep a tissue or towel nearby). At best, I think its value is to keep skin at its most effective basic level so we can get the most benefit from facials, extractions, peels, etc. But it certainly doesn’t replace any of that additional care.